My husband and I own a monstrously large, inefficient woodstove. It smokes, it has gaps in the doors which can’t be sealed with any amount of gasketing, and it eats wood by the armload. It also heats a large space once hot, but takes half a tree to get there. 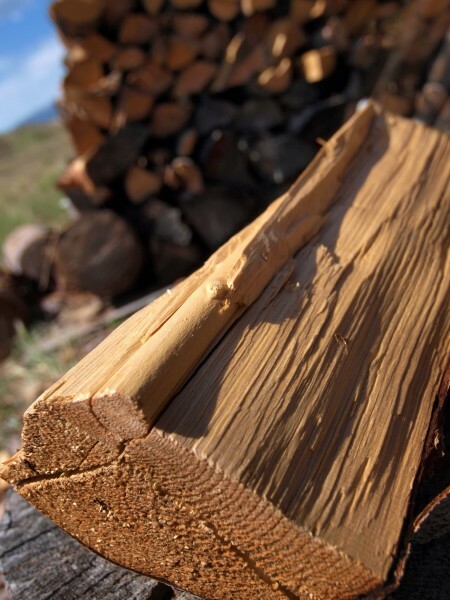 For $20, the Forest Service allows the public to cut 4 pickup loads of firewood for their own use from designated mountain areas. No living trees, dead or downed timber only. Finding the right trees–not too big or too small, uphill side from the parked truck, leaning so it will fall safely without damaging nearby trees–becomes an obsession by mid-summer. It seems we can’t drive anywhere in August when my husband isn’t on the lookout for the perfect tree. He hunts for firewood the way some folks go antiquing. My husband wields the chainsaw, while I use the axe to “limb” the side branches away so the lengths of trunk will slide into the pickup bed. 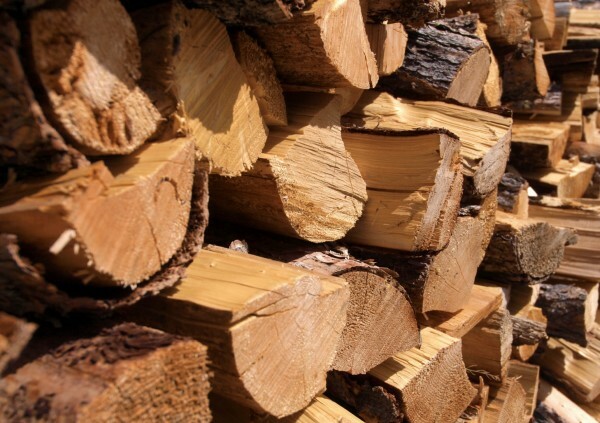 At the house, those trunks are reduced to 16″ lengths and stacked to one side of the woodpile. With any luck, the stack will remain intact through the last of summer storms, winter snowfall, and into early spring. Wood beetles depart for other territory, sap dries, and the wood begins to shrink and crack. Aspen wood is too insubstantial so despite the abundance of their dead, brittle trunks in the woods, our choices for firewood are all conifers. Juniper and Pinon Pine are often sought for their delicious scents but those shrubby trees carry much of their wood as gnarled, twisting side branches which are difficult and time-consuming to cut, especially for us amateurs. Ponderosa, fir or spruce are more attractive for us. Designated wood-cutting areas are often filled with tall, smaller diameter trees crowded together. Crowding has encouraged a slow-motion race as each tree has tried to get its piece of sunshine at the expense of neighbors. As the tops grew taller, the lower limbs became shaded and less efficient so the trees amputated those limbs slowly, as trees do by forming special cell layers within the trunk, cutting off that limb from the circulatory system. It results in trees that are straight, not too big and without a lot of side limbs–perfect in my husband’s greedy eyes. My favorite part is splitting the cured rounds into stove-ready pieces. I go out with my leather work gloves early in the morning when the air is still cold. My long-handled splitting maul is heavy and I keep a file at hand to touch up the sharp edge. A weathered Ponderosa cross-section, scarred from use and too large for my maul serves as a chopping block. I scan a piece of spruce for knots, then set it clean end up. My swing is rewarded with a solid “thunk” but the maul comes away leaving only a half-inch dent in the center of the unrotted wood. Two more swings and the section explodes with a satisfying crack, one half falling to each side of my block. I’m slow at wood-splitting because I pick up the pieces and turn them over, looking at the newly-revealed faces. Sometimes I’ve found insects still buried inches into the wood, large beetles or wasps which failed to emerge at their proper times. Or the intricate scrimshaw from bark beetles traced just under the bark now fallen away. The history of the tree is there, too. At the very center of the trunk lies the younger tree, side branches and all, heartwood preserved by the encompassing sapwood. In sawn lumber a careful woodworker would recognize the branches as small knots, most less than a half-inch across. But in splitting the wood according to its own weaknesses, sometimes those little trees pop out nearly whole, branches two inches long attached to their gleaming, perfect original trunk. I suppose we’re all a little like that–we carry our history inside ourselves and it takes some blow from the outside to reveal our central natures. Here’s to hoping you are able to find your center more regularly and less traumatically, perhaps with some time spent closer to the natural world. This entry was posted in Flowers&Fauna, Human interaction, Plants and tagged fire, firewood, mountains, outdoor, outdoors. Bookmark the permalink. Beautiful timbers, and lovely to hear its no living trees but dead/downed timber only. Just stumbled upon your blog, thanks!